Are you a night time dreamer or a day time dreamer? Today in the world many people in the world are concerned about peace and have a wish to bring an end to war, violence and people hurting other. Every day I meet people who have this yearning to make a difference to others and want to truly follow the calling of their heart. Maybe like meets like, or maybe that’s just what I am looking out for. Ultimately I believe everyone wants to be happy and want others to be happy too. It’s about caring and seeking for others what you wish for yourself. If it really is as simple as that, then why is there so much turmoil and unhappiness in the world today? If all we want is happiness for us and for others, then why do we suffer so much? I have been reflecting a lot on this – and as regular readers will know I passionately believe in making it a better world for us and others. I also believe that all it will take to dramatically improve our world today is a few committed people who really believe in their dreams and who’ll do whatever it takes to make those lofty dreams come true. Who can ever forget Dr Martin Luther’s Kind stirring speech – I have a Dream? A world in which we can all live together in peace. A world in which we co-operate and over come the most severe challenges ever faced by our race. A world in which our children no longer die of starvation. 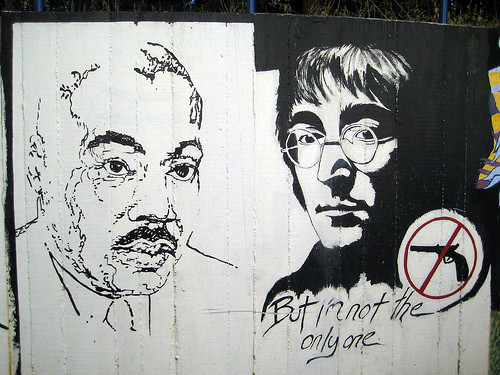 Remember this famous line from John Lennon’s eternal song – Imagine all the people living life in peace. Today, the world needs more daytime dreamers than ever before. Dreamers who will do, or die to make their dreams come true. Are you one of them? And what’s your big dream for yourself and the world? And then take inspired actions to make it happen. Share in the comments section below your big dream for your self and for the world. Arvind, I love T.E. Lawrence’s quote at the beginning! That definitely resonated within me. I think we all are capable of dreaming in the daytime, but there’s a wide gap between those who don’t do anything to further their dreams, and those who do. The former category are called ‘daydreamers’, they wish for a better everything but never take steps to get there. The latter category are called ‘daytime dreamers’, who balance dreaming with actions, and eventually realise their desires. Stuart, T.E.Lawrence’s quote is what inspired me to write this article. Actually, I seemed to channel this post and most of my words just flowed in a matter of minutes. As you probably know, the film Lawrence of Arabia was based on the lifestory of T.E. Lawrence. Love this, and so true, we all need to remember that whatever we can dream, we can achieve….most of us can think bigger and do more to reach the stars. Let’s all dream bigger dreams and reach for the stars….. This is an important reminder to all of us to consciously create the world that we live in. We must begin to recognize others as ourselves and implement the belief that we are all one. What we do for another we do for ourselves. Justin, yes indeed we consciously create our world. And the moment we realise that we are all one, it’s a paradigm shift. All for one and one for all – that’s the ideal we can all strive for. “If it really is as simple as that, then why is there so much turmoil and unhappiness in the world today?” — If only we could find an answer to that! Interesting post, Arvind. I came here from IndiBlogger, and I am glad I did. Priya, welcome to my blog, and thanks for your positive endorsement. As you say, if only we could find an answer to why there is so much turmoil and unhappiness in the world today. Priya, I wish you well on your journey. Shared via Twitter, because this post rocks! I’m adding in my vote. Yes, I’m a dreamer. It’s been a long and difficult path. It seems to me the path of a dreamer is sometimes difficult, sometimes natural, and sometimes pure bliss. We can go through ups and downs and in-betweens – but in the end, our dreams always seem to pull us through. The dreamers are the ones who reach for the stars and find the ways to get there. After all, where would this planet be without the no-hopers as they were called who broke records, broke small thinking, broke attitudes of what was possible, and broke the back of playing it safe all the time? We all have to climb our own Everest or run our personal four minute mile in some way, but we’re only going to do it if we leave our chair and leave behind our lack of self-belief. Everyone has a mountaintop with their name on it! Dream on Arvind, dream big, and dream often. John, thanks for eloquent words! John, great to see you forging ahead with your dream of helping more people around the world be 100% themselves. As usual your words are inspiring and hold special sentiment for me being a DREAMER myself. I so thank you for all you are doing to encourage others to DREAM. Arvind: I love this post and the message. I totally agree with you that we can really make the world a better place. It is all about finding your role and passion and then acting on it. Great message and very inspiring. Sibyl, I am glad my message resonated with you. Knowing you well from your blog, you are clearly someone who has found her passion and following it. Keep it up! Here’s what I dream and wish for the world…..to help create loving, engaging, spiritual, exciting and beautiful spaces for the spirit…..as well, I would like to make sure they are serving the environment using what we have and recycling…..I would like to incorporate global design into my designs and let every one feel loved in their living environment……this includes rich, poor and in between. Thanks Renee for sharing your wonderful dream for the world.